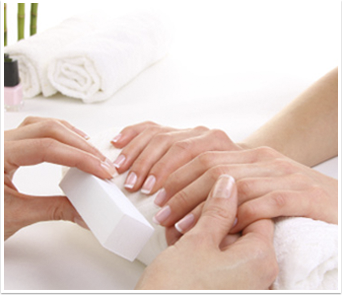 Aromatic soaking and cleansing of the fingernails, followed by a soothing massage for hands and arms. A 14 day gloss manicure that goes on like a polish but cures like a gel with an LED light. Dries instantly with no chips or smudges. A hand softening experience. Hands are treated to an exfoliated scrub and masque then wrapped in warm, aromatic towels to soften the skin. Finished with a soothing massage and polish. This luxurious service begins with an aromatherapy foot soak, followed by an exfoliated scrub of feet and legs. Your feet are then masqued and wrapped in warm, aromatic towels, and ending in a relaxing foot and lower leg massage, leaving you feeling smooth and soft. A busy and active lifestyle can lead to build up of hard skin and calluses on the foot. The callus peel using alpha hydroxyl acids, softens hard calluses quickly leaving your skin silky smooth. The orange peel patch is wrapped around the bottom of your feet, lifting the calluses up and off your feet. Once soaked, a sloughing file is used to remove most of the callus, finished with a moisturizer to leave soft, fresh, new skin.